On 26 January, India will host all the leaders of the Association of Southeast Asian Nations (ASEAN) for its Republic Day parade. While this visit fits squarely within India’s ‘Act East’ policy, it also follows from what is arguably the most significant geopolitical transition since the end of the cold war: a flailing US-led system and the rise of Asia. The importance of this region in the 21st Century was cemented in November last year, when India joined the United States, Australia and Japan to announce the revival of the Quadrilateral Dialogue (‘Quad’) – a democratic economic and security partnership intended to shape a ‘free and open’ Indo-Pacific. Clearly, the subtext behind the Quad is China, which has over the past few years effectively strengthened its leadership in the region through economic statecraft and military coercion. 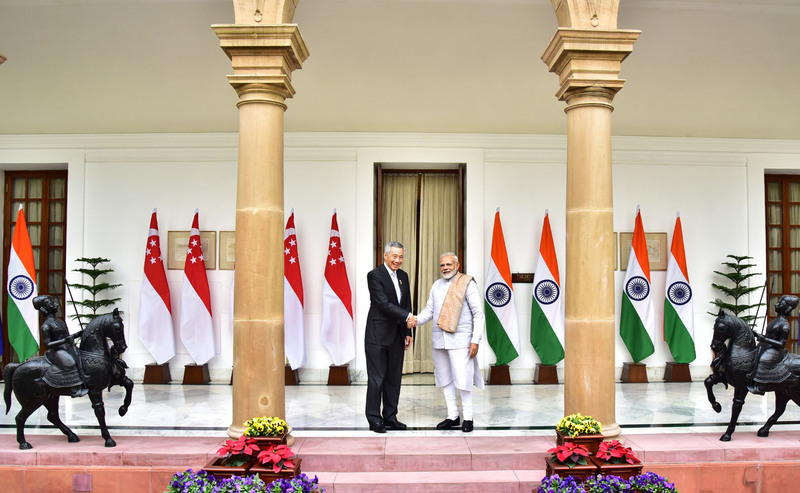 That India’s invitation to ASEAN leaders comes soon after these developments is an indication that it intends to challenge Beijing’s leadership and offer an alternative vision for the region. The outcome of this contest between the two Asian giants will be predicated on three key determinants: political norms; economic development and infrastructure connectivity; and security cooperation. As things stand today, however, Beijing has the lead on all three fronts. For one thing, ASEAN’s tremendous progress on human rights and democracy through the 1990s and early 2000s appears to be waning. In Cambodia, strongman Hun Sen has effectively cracked down on opposition leaders and the free press. In Thailand, the military Junta continues to consolidate power. In Myanmar, the exodus of Rohingya Muslims has precipitated one of the world’s worst humanitarian crises. In Indonesia, radical Islam is straining the country’s liberal framework. In the Philippines, Duterte’s violent anti-narcotics campaign has received condemnation from the United Nations. Meanwhile, in Malaysia, Prime Minister Najib Razak has used the 1MDB corruption scandal as a pretext to suppress dissent. China is only too happy to deal with this democratic deficit. Last December, China voted against a UN resolution condemning the crackdown on the Rohingya, even as India chose to abstain. In recent months, Myanmar’s defacto leader Aung San Suu Kyi has considerably warmed to Beijing, conveying gratitude over “China’s understanding of the Rakhine issue”. Similarly, in May 2017, China praised Duterte for his “remarkable achievement” in protecting human rights, even as he orchestrates Manila’s pivot away from the US. India might struggle to navigate these trends, especially as the country overtly associates with like-minded democracies such as the US, whose own ties with the region are currently strained. This political turmoil feeds directly into China’s economic leadership in Southeast Asia. Most ASEAN leaders are concerned about development and trade integration. Between 2003 and 2016, almost 10 per cent of ASEAN’s Foreign Direct Investment (FDI) inflows were from China, placing it 3rd after the US and Japan. India’s FDI accounted for a mere 3 per cent in that same period. Similarly, China trades nearly US $450 billion in goods and services with ASEAN, compared to India’s US $76 billion. Even as other nations limit their investments in the face of deteriorating human rights conditions in Southeast Asia, China has funnelled over $800 million into hydro-power projects in Cambodia that are likely to displace thousands, and over $10 billion into the crisis-hit Rakhine state last year alone. Adding to this, Beijing has a clear vision for connectivity in the region under the aegis of the Belt and Road Initiative (BRI), which will integrate China’s prosperous coastal zone with the economically dynamic ASEAN states. India, on the other hand, has struggled for over a decade to implement its flagship projects: the India-Myanmar-Thailand Trilateral Highway and the Kaladan Multimodal Transit Transport Project. Further, New Delhi has often been intransigent about trade deals, refusing to join the Trans-Pacific Partnership and playing spoiler in the Regional Comprehensive Economic Partnership. In fact, India has yet to secure membership in the Asia Pacific Economic Cooperation (APEC) Forum. Even as these political and economic dynamics are playing out, China is now seen as the dominant military power in the region, supplanting even the United States. While many ASEAN states are clearly unhappy with Beijing’s unilateral aggression in the South China Sea (SCS), a reticent Washington and a lack of alternatives naturally push them into China’s orbit. The fact that ASEAN is willingto negotiate a code of conduct in the SCS, despite the 2016 Hague Tribunal ruling invalidating many of China’s maritime claims, underscores this reality. India has repeatedly called on China to adhere to a ‘rules-based international order’. However, given New Delhi’s own operational shortcomings and divergent strategic concerns, it is unlikely that India has the capability or willingness to deploy military force in the SCS in the near future. While China currently enjoys enormous power in the region, a more assertive India could potentially challenge this status quo. In December 2017, for example, India hosted the ASEAN-India Connectivity Summit in a bid to offer alternatives to the BRI, which New Delhi has criticised as an attempt to ‘hardwire’ influence in the region. That several Southeast Asian states have quietly expressed concerns over the economic viability and environmental safety of BRI projects illustrates India’s normative power. Similarly, with an eye on China, countries like Vietnam, Indonesia and Singapore have all worked to improve bilateral defence and maritime relationships with India. Speaking at the Raisina Dialogue earlier this month, India’s Foreign Secretary S. Jaishankar acknowledged that the idea of a rules-based order is no longer limited to the US-led system. New Delhi recognises that the future of the international order will be determined in Asia, specifically in the ‘Indo-Pacific’. India’s Republic Day invitation to ASEAN leaders is an indication that New Delhi will exercise its influence to shape this order. Yet its ability to do so in the near future will depend on how it navigates turbulent political, economic and security headwinds. Akhil Deo is a Research Assistant at the Observer Research Foundation. This article was first published on the Asia and The Pacific Policy Society blog and can be found here.Image credit: by Indian Ministry of External Affairs/Flickr.